Invasive migration of RA FLS was analyzed through growth factor–reduced Matrigel-coated transwell inserts in the presence or absence of 1 µM INK007, 5 µM CAL-101, or 0.3 µM IPI-145, or 0.3 µM GDC-0941 inhibitors or DMSO. Cells were allowed to invade through Matrigel toward PDGF-BB (25 ng/ml) containing media for 24 h and were fixed and stained with Hemacolor staining kit. J Immunol, 2014, 192(5): 2063-70 . Idelalisib (CAL-101, GS-1101) purchased from Selleck. Ppp2r1afl/fl BCR-ABL1 B-ALL cells transduced with 4-OHT-inducible Cre-ERT2 (Cre) or ERT2-vector (EV) were treated with 4-OHT for 3 days and cell lysates were studied by phospho-protein array analysis. Ppp2r1afl/fl BCR-ABL1 ALL cells were transduced with 4-OHT-inducible Cre or EV control and incubated in the presence of the small molecule signaling inhibitor idelalisib (32 μmol/L; C). Percentages of GFP+ cells were measured by flow cytometry at the times indicated following 4-OHT-treatment. Data are shown as mean ± standard deviation (SD) and representative of at least three independent experiments. Cell, 2018, 173(2):470-484. Idelalisib (CAL-101, GS-1101) purchased from Selleck. Rolling and sticking fractions of calcein-labeled CLL cells from a patient with bulky disease are shown before treatment, and at 3 or 7 weeks under idelalisib treatment. Mean ± SD, venular order III (n = 3), order IV (n = 4), order V (n = 3-4). Unpaired t test; *P < .05, **P < .01. Blood, 2016, 127(25):3192-201. Idelalisib (CAL-101, GS-1101) purchased from Selleck. 293T cells were transfected with HA-tagged Fbxo45. At 48 h after transfection, cells were treated with AKT inhibitor (CAL-101; 10 uM, 4 h), cell extracts from the cytoplasm or nuclei were subjected to IP with anti-HA resin followed by western blot analysis with indicated antibodies. Cell Death Differ 2014 21(10), 1535-45. Idelalisib (CAL-101, GS-1101) purchased from Selleck. Isoform-selective PI3K inhibitors blocked PI3K signaling in corresponding Rh30-Myr-p110 cells. Rh30-Myr-p110s cells were cultured in serum-free medium for 12 h, and then exposed to CAL-101 at indicated concentrations for additional 1 h. The cells were collected to detect the level of phosphorylated and total Akt. β-Actin was served as loading control. Acta Pharmacol Sin 2013 34(9),1201-7. Idelalisib (CAL-101, GS-1101) purchased from Selleck. After starved in serum-free medium for 24 h,A549 cells incubated with the indicated concentrations of CAL-101 for 3 h,followed by 20-minute stimolation of 100ng/ml EGF. Dr. Zhang of Tianjin Medical University. Idelalisib (CAL-101, GS-1101) purchased from Selleck. PI3K assay is preformed on whole-cell lysates from CLL or normal B cells. A PI3K ELISA assay is performed. Briefly, whole-cell extracts are added to a mixture of PI(4,5)P2 substrate and reaction buffer containing adenosine triphosphate (ATP) and allowed to incubate at room temperature. The reaction is stopped by adding PI(3,4,5)P3 detector mixed with EDTA (ethylenediaminetetraacetic acid) and allowed to incubate at room temperature for 1 hour. After this time, the mixture is transferred from each well to a PI3K ELISA plate and allowed to incubate 1 hour. Plates are washed and then incubated with secondary detector for 30 minutes. Plates are washed again, and 3,3′,5,5′-tetramethylbenzidine solution is added for 5 minutes at which time H2SO4 is added to stop all reactions. Plates are read at 450 nm on a Labsystems 96-well plate reader. Method: MTT assays are performed to determine cytotoxicity. 1 × 105 cells are incubated with CAL-101. MTT reagent is then added, and plates are incubated for an additional 20 hours before washing with protamine sulfate in phosphate-buffered saline. DMSO is added, and absorbance is measured by spectrophotometry at 540 nm in a Labsystems plate reader. Cell viability is also measured at various time points with the use of annexin/PI flow cytometry. Data are analyzed. At least 104 cells are counted for each sample. Results are expressed as the percentage of total positive cells over untreated control. Experiments examining caspase-dependent apoptosis included the addition of 100 μM Z-VAD. Experiments examining survival signals include the addition of 1 μg/mL CD40L, 800 U/mL IL-4, 50 ng/mL BAFF, 20 ng/mL TNF-α, or coculturing on fibronectin or stromal (HS-5 cell line) coated plates. Stromal coculture is done by plating a 75-cm2 flask (80%-100% confluent) per 6-well plate 24 hours before the addition of CLL cells. Lannutti BJ, et al. Blood, 2011, 117(2), 591-594. Herman SE, et al. Blood, 2010, 116(12), 2078-2088. Meadows SA, et al. Blood, 2011 Dec 30. What is the recommended dose of CAL-101 and the route of administration for mouse studies? 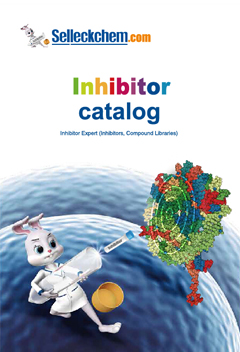 LY294002 : Pan-PI3Kα/δ/β inhibitor, IC50=0.5 μM/0.57 μM/0.97 μM. 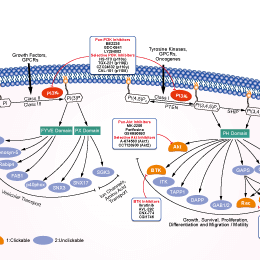 Hexestrol : Phase II for Advanced Breast Cancer.